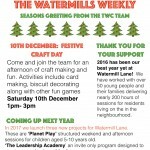 It really has been a phenomenal year for Together We Create and the residents of Watermill Lane. We have worked with over 50 young people and their families delivering nearly 200 hours of sessions for residents living on the in the neighbourhood. ‘Planet Play’ structured weekend and afternoon sessions for children aged 5-10 years old. ‘The Leadership Academy’ an invite only program designed to create young leaders of the future. ‘The Community Lunches’, more changes for residents to get together to share food and and make friends. Our thanks to BBC Children in Need and the Team from Origin Housing for their support.